Pápai Páriz Ferenc, Album amicorum p. 458. Otto Friederich Corthum Hamb[urgensis] M. Dr.
Lugd[uni] Bat[avorum] d. 31. Aug. M.D.CCXIX. * Cicero, De inventione 1.5. Otto Friedrich Corthum was born on July 6, 1692 in Sülfeld, the son of the pastor Justus C. (?-1724) and of Anna Elisabeth Lütkens, brother of the later pastor Justus C. (1684-1731) and of the later lawyer and Mayor of Hamburg Lucas C. (1688-1765). He learned in the Joanneum and from 1709 in the high school of Hamburg, then he went to Leipzig to attend medicine. In 1717 he immatriculated in Leiden, where he graduated in medicine on July 3, 1719. Then he practised in Hamburg. He died on April 6, 1726. His dispute and examen were published: Dissertatio de anima rationali, an sit corporis vitale principium? sub praesidio Polycarpi Gottlieb Schacheri … subiiciet Otto Fridericus Corthum. Leipzig, 1715. – Disputatio inauguralis de aeris, seorsim ab ex-halationibus considerati, in corpus humanum effectu. Leiden, 1719. 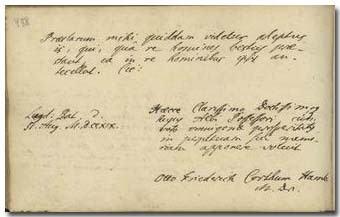 Otto Friedrich Corthum wrote his memento in the album of Pápai Páriz some weeks before his doctoral examen.